Newburgh Juniors are on the hunt for a new manager after the East Shore club parted company with Gordon Urquhart. 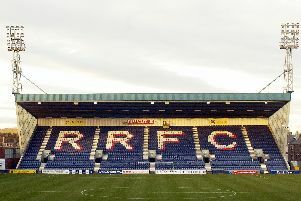 ‘Burgh, who sit second from bottom in the McBookie.com North Division, had been starting to pick up results as they crept further away from bottom side Forfar Albion. However, the good form didn’t last, and was tempered in recent games with a crushing 8-0 defeat to Glenrothes last Wednesday and a 4-0 loss at home to Kirriemuir Thistle at the weekend. Mr Urquhart stepped down on Saturday. And it’s not the only change to take place at the junior football club with their long serving chairman and secretary also leaving recently. A spokesman for the club said: “The recent meeting held at Newburgh to encourage people to join the committee and assist with the running of the football club resulted in nine new committee members being recruited. “Newburgh’s committee is now a very healthy 13 bodies strong. “All of these committee members are first and foremost passionate Newburgh fans. “They are all committed to making the club a little bit better every day building everything around the football team that is on the park. “We have a desire to make Newburgh as professional and well run as is possible within our means. On the park the search is not on to find Urquhart’s replacement. The club’s league position may not be the healthiest right now, but the committee feel there’s still plenty to attract a high calibre of gaffer to the ‘Burgh. “The club would encourage anyone who has an interest in working with us to apply to fill our managerial vacancy,” added the spokesman. “We will look at every application with a view to appointing a manager or management team that shares our vision of the future for our club. “We have good facilities and a ground that is a credit to the hard work that goes on around the club throughout the week by a dedicated group of volunteers. Applications will be reviewed this coming week to ten days with a view to carrying out informal interviews week beginning May 23.